BaitRageous: A lake shaped just like a dragon! A lake shaped just like a dragon! Can you see the dragon? I can! 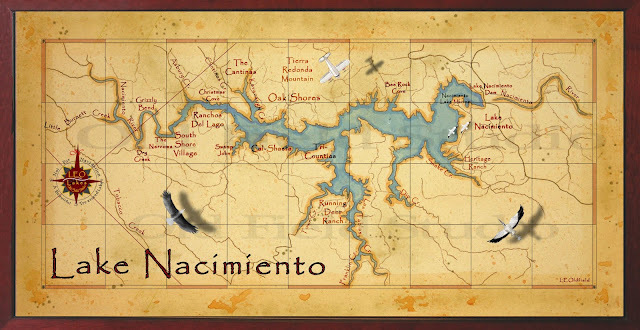 I did this custom map of Lake Nacimiento, also referred to as the Dragon Lake because it is shaped like a dragon. It's located in California near Paso Robies. Interestingly, Nacimiento means "beginning or source" in Spanish, which makes sense. I painted this map for a very nice lady who has a cabin on the lake and plans on hanging the map over the fireplace. I received an email from her after the map was delivered and here is what she said. We got the map and it is absolutely stunning. I can't wait to hang it over the fireplace! Thanks again, we are so pleased. It's truly a work of art."